Dead Zed 2 is part 2 of this interesting shooter series developed by 3KG GAMES. 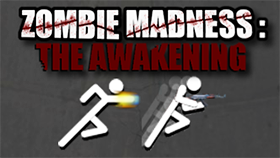 This game has simple graphics, suitable for those who love guns and zombies. You can experience this game on your browser because it is a flash game. Time: This is your resource. Time is used to search parties, repairs weapons and upgrades. You will have "Time" after killing zombies. Morale: Morale affects the performance of the survivors. You can increase this feature by finding supplies, survivors and weapons. Day: You need to survive for 40 days to complete this game. Barricades: It shows the stage of the improvised defense against zombies. The interesting point in this game is that you will be able to use "Rage Mode". Each time you kill zombies, Rage Mode bar will increase. When this bar is full, you can use it. You can kill zombies with only 1 bullet while you are in Rage Mode. If you like this game, you can also play others games with the same game play such as Weapon, Zombudoy, … or you can play the 1st part named Dead Zed.